Leland’s cabins are prefab log cabins. What does that mean? It means we build our cabins here at our headquarters in Grandview, Texas, instead of building them on site. Why don’t we build the cabins on site? The first reason is quality assurance. By building our cabins in our workshop, we have everything we need on hand to create the craftsman-quality cabins we’re known for. There’s no time wasted by making a lengthy trip back to headquarters to get this or that. And there’s no compromises made in the quality of the build because we’re constrained by time and budget. The bottom line is this: By building here, we are able to keep the cost of each cabin lower and the quality higher. Did you see Part One of this series? In Part One, we talked about the floor and wall construction of every cabin. 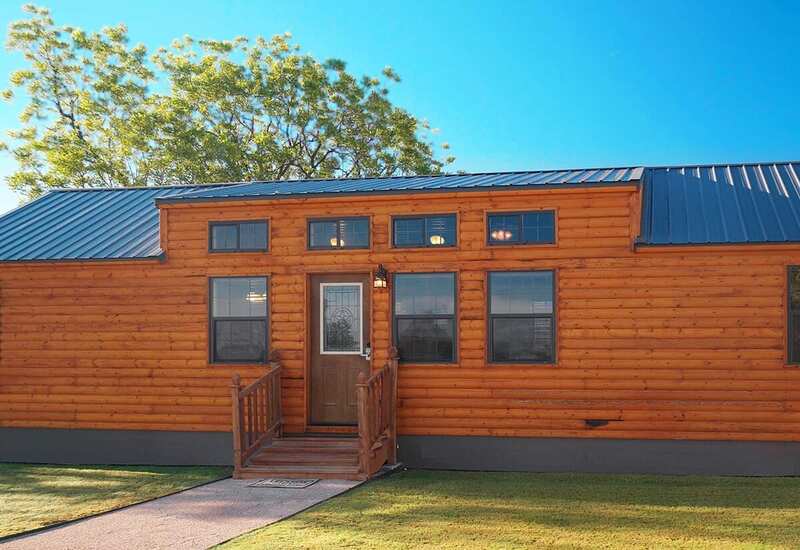 Our Texas cabin homes are built to stay, which means they’re built ready to be placed on the foundation of your choice. We start with the beams and joists before moving to the subfloor and walls—just as a traditional on-site home is built. After the interior frame is built, we move on to create the stud walls that mark the division of the interior space. Then we build the exterior walls and add the roof. Watch the process. It’s so satisfying to witness something being formed right before your eyes. Now that the frame is in place, we can add the exterior plywood. Once it’s on, it’s time to cut out the openings for the windows and doors. And of course, we can’t forget housewrap. What is housewrap and why do we use it? The housewrap we use is made of a durable, high-density polyethylene woven substrate. This woven material is designed to keep water and air from making their way into the cabin while allowing any vapor on the plywood to evaporate out. This is especially important to prevent any moisture damage in high-heat areas. Why high-heat areas? Think of a soda can, fresh from the refrigerator, sitting out on the counter in your kitchen. The contents are nice and cool. The air in the room around it, though, is warmer. The result is condensation on the exterior of the can. Cabins and homes in high-heat, high-humidity areas can also create an environment for condensation as the hot air from outside meets the cool air from the inside of your home. The housewrap we use allows any vapor created from the meeting of the hot and cool air to easily escape, preventing wood rot and moisture damage. Prior to the 1970s, houses were wrapped in felt paper for the same effect. The housewrap we have chosen to use is rated to withstand high wind exposure as well. So it helps to hold everything together and keep the wind out, which is especially useful on a windy Texas plain or in Hill Country. Beams are heavy. Just ask Leland’s builders. They use the equipment we have on hand at our workshop to lighten the load, though. Once beams are in place, it’s time for rafters. Rafters are the long, angled boards you can see being put into place in the video. The rafters stretch from the central beam to the eaves. Watching our builders walk the walls to put the rafters in place for the roof might be the best part of any build. These guys don’t miss a step (thankfully) as they expertly craft cabins. Once the beams and rafters are in place, it’s time to add the OSB. The OSB (or plywood) forms the decking for the roof, upon which we’ll install felt and metal roofing later. While the process doesn’t move as quickly as the above video, it does move swiftly. We can complete an entire cabin in about six weeks. That gives customers the perfect amount of time to prepare the site for their new cabin. You can line up the help you need to install utilities and have a foundation ready as well. For our customers, the hardest part isn’t the build or installation process. It’s choosing exactly what you want in your custom cabin. Our cabin specialists are ready to help you weigh your options and choose the perfect cabin to fit your budget and your dreams. Do you want to take a look at our cabins firsthand? We have the largest cabin showroom in Texas ready and waiting for your perusal. You can see each of our cabin floor plans in person by walking through each cabin model we have set up here. From The Stag to The Ponderosa and Settlement Harbor, there’s a wide range of cabins to suit any budget.